Foster care can be a temporary home for a child, allowing a birth family to safely work through a crisis followed by the child returning to a home that has had time to heal and grow. However, when that is not possible, Family Ark wants to ensure all children have a forever family—adoptive parents who will be there for all of life’s challenges and joys. We recently witnessed that joyous outcome for one of our foster families. 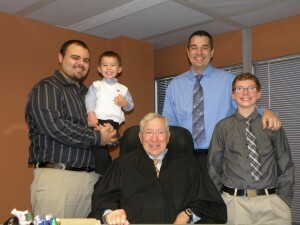 Gary Stallings and Paul Kilbourne accepted placement of two brothers in December of 2011. These two young boys demonstrated resiliency as they received substantial therapeutic support. Over time, it became clear that returning the boys to their birth family was not going to be an option. “When reunification was obviously not going to occur we decided to inquire about adoption. Family Ark staff assisted us with a new home study and even showed up at the adoption hearing to support us,” Paul said. The journey to giving these two boys a loving, permanent home took about a year, but on November 14th 2013, all parties were in a court room in Indianapolis to make the boys place in the Stallings/Kilbourne family official. “The feeling of becoming permanent parents to our two children was one of the happiest feelings in our lives. We highly suggest exploring the world of foster parenting. The children make it so worthwhile,” Paul said afterwards. Family Ark wishes Gary, Paul, and their new family all the best!